In order to celebrate the XII anniversary of the Holy Regency's Islamic Arts and Calligraphy (PSKQ), a series of events were held, one of which was the International Calligraphy Exhibition. The event was held a full month from 25 January - 25 February 2019 in Arjuna Resto, to the west of the campus of the Holy Muria Kudus (UMK) University. 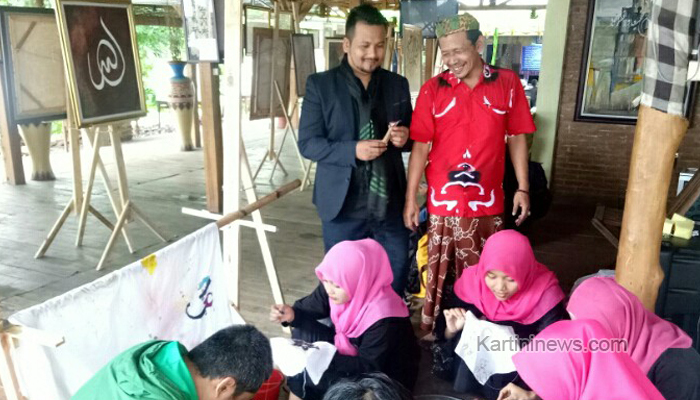 Muhammad Assiry, Caregiver of PSKQ Kudus, said that the PSKQ this year should carry the theme, calligraphy Indonesia, Indonesian calligraphy. Participants were followed by one hundred calligraphy from various cities in Indonesia and abroad, namely from Turkey, Morocco, Malaysia and Singapore. "There are many agendas besides exhibitions, including 3D calligraphy workshops by Nugroho (Yogyakarta Calligraphy sculptor), batik calligraphy workshops by Ansar Basuki Balasik (the owner of Cilacap Angsoran batik), business calligraphy workshop by Midhan Anis (Chairperson of Calligraphy Lovers Community), calligraphy painting workshop contemporary by KH. "Robert Nashrullah (International Calligraphers) and calligraphy painting demonstrations together with 100 calligraphers from various regions in Indonesia," he explained to the media crew. Assiry said, there was something interesting in this event, the tehzib motif from Turkey with a golden motif also enlivened, the price was priced very fantastic. In addition there is also a stretch of calligraphy on a canvas measuring around 2x1 meter with moral messages in it. Assiry said, the calligraphy described the current state of the Indonesian nation, where problems and disasters were sweeping our beloved country. The sentence "Wa’tasimu Bihablillah jami'a wala tafarroqu" interpreter explains hablillah (Allah's rope) by being infused (Allah's religion), which means that we should not make the people divide as long as they claim to be Muslims. "To make that difficult calligraphy the idea, if just painting isn't too difficult. Even before finding an idea I had to fast first, "he said. Assiry hopes that this exhibition can contribute to the nation, especially Kudus. "This is an international exhibition event, hopefully next year it will be lively again, especially with the support of the Kudus Regency Government," he hoped. 0 Response to "International Calligraphy Exhibition of PSKQ Held in Kudus"